How can I use this activity in my classroom? Recalling how much my classmates and I loved those interviews, I was inspired to do something similar in my own classroom. Instead of a clipboard with questions, I created a little booklet using a spiral notebook of index cards. On each page, I wrote a random question and a number. More and more questions were added every year. I use the booklet in two ways. The first way is a simple get to know each other activity for the beginning of the school year. Each student answers one question. The questions and answers create a lot of laughs and quickly get everyone comfortable with their weird teacher and new classmates. The second way can be used throughout the year to fill the minute or two of extra time at the end of some class periods. For this method, I get out the booklet of questions and ask my students to raise their hands if they want to participate. Usually, almost all hands go up. (I wish I could get that kind of participation with content related questions...) The student I call on tells me a number between 1 and 120, which is the number of questions I currently have in my book. Then I read the corresponding question from the book. After we listen to the student’s answer, I call on to a different student. Sometimes multiple students answer the same question, other times I have them choose a different number. I ask a variety of questions in my book. Some questions are silly and others are more serious or basic. The students like the randomness and not knowing just what kind of question they are going to be asked. I avoid questions that might cause a student to feel uncomfortable or embarrassed. I also allow students to skip a question if they prefer. Favorites: What’s your favorite kind of candy? What’s your favorite movie genre? Would you rather: Would you rather be able to talk to animals or time travel? Would you rather eat a stick of butter or drink a glass of ketchup? Have you ever: Have you ever gone swimming in the ocean? Have you ever accidentally walked into a wall? Opinion: Should students get paid for good grades? When should kids get their own cellphone? Random: What would you do if your lovely grandmother made you a special meal and it tasted terrible? What musical instrument do you wish you could play? How can I make my own booklet? If you want to try this in your own classroom, there are a few ways you can make your own. Use a clipboard with questions: This is the easiest, quickest, and least expensive option. You can type the questions on the computer and save the document. It’s easy to add questions throughout the year. One drawback is it has the highest chance of getting lost or beat up with repeated use so you might need to reprint occasionally. Plus, it just isn’t as fun. Make a booklet using spiral bound index cards: It’s a bit more expensive and time-consuming, but it looks nice and holds up well. You will have to write the questions by hand unless you want to print them out and glue them. One drawback is the limited space. If you keep adding questions, eventually you’ll run out of room in your spiral book. Hole punched index cards, cardstock, or laminated paper held together with a metal book ring or string: This is definitely the most time-consuming option but also the most versatile. You can write the questions by hand or type them with a computer. You can customize it with colored paper and fonts. You can rearrange, remove, and add as many questions as you’d like. For some teachers, this might be a fun summer project. I like the idea, but I don’t have the time to write all of my own questions. Where can I get a premade set of questions? 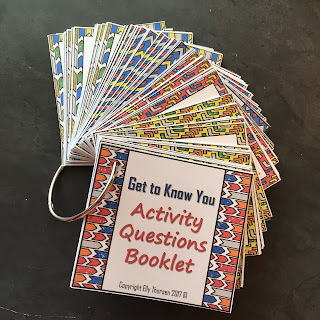 In my Teachers Pay Teachers store you can make your own ring booklet with all 120 question cards I use in my own classroom. Take a look at it here. Asking those silly questions and hearing my students’ answers and laughter is something I look forward to. I don't bring out the booklet too often, maybe once every other week, but it is always a fun time for the entire class and helps maintain a positive classroom culture.